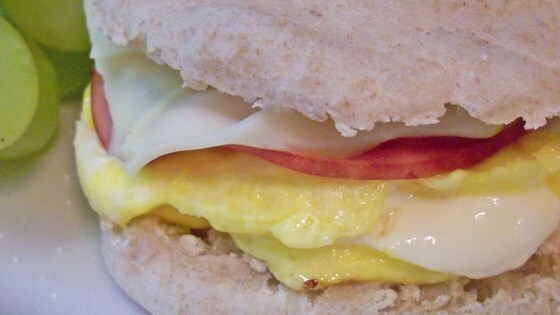 "These breakfast muffin sandwiches are perfecto for a quick breakfast at home. I like to freeze them and pop them in the microwave for a grab and go breakfast. These sandwiches don't need to be made with sausage, they can be made vegetarian, with ham, bacon or any type of meat you enjoy in the mornings." Split the muffins open with a fork and toast them in a toaster oven. In a large bowl scramble the eggs, green onions and cheddar cheese together. Heat vegetable oil in a skillet, pour the egg mixture into the skillet and let it fry in one layer as you would an omelet. When the egg is cooked on the underside, flip the egg over and cook the wet side; remove from heat when cooked through. At the same time that the eggs are frying, form the sausage into small patties. Place the sausage in another skillet. Fry until browned, remove from pan and drain on paper towels. Make the muffin sandwiches by layering a piece of sausage and a piece of the fried egg between the two muffin pieces. If you intend to freeze the sandwiches, let each part of the sandwich cool before make the sandwiches, then wrap them in plastic wrap and freeze. Reheat in the microwave. See how to make easy, cheesy breakfast chilaquiles. These are the best and great for on the go! I almost always use canadian bacon and sliced cheese but whatever you have on hand is bound to taste good on an english muffin. Been making these for years. I always use the egg rings, makes it so much nicer, except for cleanup.. A hearty breakfast to start off the day when you have to get out and work around the house.